Trying to figure out what kind of piping you need to install your fireplace, stove, or any other hearth appliance can be an intimidating task. In an effort to simplify things for you, we will look at several aspects of the most common types of chimney pipe and explain their uses and applications. What we have here is a guide to help you, the consumer, become a bit more familiar with chimney pipe. First and foremost, in any installation, the owner's manual for your hearth appliance should be consulted. Different fireplaces and stoves have varying venting requirements. These requirements involve more than just the kind of pipe you need, it also includes specific information regarding clearances and offsets that must be followed for safe and proper installation. If anything in your manual is unclear or confusing, you should contact the manufacturer of your appliance directly. If you need further assistance--or if you simply can't get a hold of anyone there--feel free to give us a call at 1-800-203-1642, or email us at info@efireplacestore.com. We will be happy to assist you in any way that we can. Class A chimney pipe has many names; it can also be referred to as double-wall chimney pipe, triple-wall chimney pipe, all-fuel pipe, or insulated chimney pipe. Class A pipe is used to vent high-temperature exhaust from burning many common fuels such as wood, coal, and oil. Basic examples would include fireplaces, stoves, boilers, and oil-burning furnaces. Not every venting system will require the use of Class A pipe, but it is absolutely necessary for use with all wood-burning fireplaces and stoves. Class A chimney pipe is usually UL-listed, which permits various manufacturers' pipe to be used with an even wider variety of manufacturers' fireplaces, stoves, inserts, and furnaces. However, it is important to note that you should never mix-and-match different brands of class A chimney pipe within one chimney system. The different brands of pipe are all distinctly engineered and must be used as a complete system from beginning to end. If you are needing to extend or redesign your current chimney system, you need to determine the make and model of your class A pipe and purchase that same type if at all possible. If it is a discontinued or obsolete brand, you are in the tough spot of having to rebuild your chimney system from scratch. Building codes prohibit the use of any adapters to link different chimney brands. In a chimney system where you are converting stove pipe to class A pipe (see the Stove Pipe section for more details), you may reconfigure your stove pipe system apart from your class A system and vice versa. Solid-packed chimney: These pipes have smaller inner diameters (usually ranging from 5 inches to 8 inches) that have some insulation, either double-wall (like Simpson Dura-Vent DuraTech pipe) or triple-wall (like Simpson Dura-Vent DuraPlus pipe). These pipes use fiberglass or ceramic insulation to stay cooler on the outside and have a 2 inch clearance to combustibles. Air-cooled chimney: These pipes have larger inner diameters (usually ranging from 8 inches to 24 inches) that have no insulation. An example of this kind of class A pipe is the FMI chimney pipe that is required for use with FMI and Vantage Hearth manufactured fireplaces. As the name implies, these pipes rely on the air circulating within them to keep the outer wall cooler and also have a 2 inch clearance to combustibles. When using class A chimney pipe, it is important to know that plenty of money can be saved if you plan your system wisely. Class A pipe is usually manufactured with either a stainless steel outer wall or a galvanized (or galvalume) outer wall. When running class A pipe within a masonry chimney, a chase, an attic or any enclosure inside the home, it is economically wise to use galvanized pipe. If at all possible, it is recommended to install your chimney in the interior of your home. Having your system outside brings with it the risk of a cold chimney, which would hinder drafting and produce more creosote. The need for stainless steel only arises when your pipe will be exposed to the elements. If galvanized pipe is exposed, it is susceptible to rust and corrosion that will eventually ruin it if left unprotected. If you must use galvanized pipe outside, it is strongly recommended that you paint your pipe with a high temperature, rust-resistant paint. Galvanized piping must be cleaned and prepped, prior to painting. Direct-vent pipe is made specifically for a direct-vent gas appliance. The term "direct-vent" refers to an appliance that uses only outside air for combustion and vents all exhaust directly back outside. The appliance itself is sealed off from the room by a glass door that should never be opened while the unit is in use. Direct-vent units are among the most popular with consumers because of their efficiency and ease of installation compared to traditional wood-burning applications. Coaxial pipe. Like a pipe-within-a-pipe, a coaxial system utilizes a smaller inner pipe that is fixed inside a larger outer pipe. The inner pipe is separated from the outer pipe by spacers. The inner pipe removes the combustion by-products and vents the exhaust out of the appliance and out of the home. The space between the two pipes brings fresh air from outside into the appliance for combustion. Coaxial pipe may be rigid or flexible. Colinear pipe. This is a system with two separate pipes, one for combustion air and the other for exhaust. These kind of pipes are usually flexible. Clearances for direct vent pipe may vary, and they will be specified by your direct-vent appliance's manufacturer. The general rule-of-thumb, however, is a 1-inch clearance all the way around for vertical pipe. For horizontal pipe, there is to be a 3-inch clearance for the top half of the pipe, and a 1-inch clearance for the bottom half of the pipe. Direct vent chimney systems are specialized. Every component: pipe, elbows, firestops, roof supports, termination caps, et al--is specifically made for venting a direct vent appliance. You will never convert direct vent pipe to class A chimney pipe and you will never convert stove pipe to direct vent pipe. In some circumstances, it is possible to utilize specialized adaptors to convert Class A chimney pipe into a direct vent system. Unlike stove pipe, the use of roof supports and thimbles with direct vent systems is not also a conversion point to class A chimney pipe. These components are only used to pass direct vent pipe safely through a ceiling or a wall. The owner's manual of every direct vent fireplace, stove or insert will specify what manufacturers of direct vent pipe are approved for use with that unit. A unique and convenient aspect of direct vent chimney systems is the ability to vent and terminate in various ways. A system can be terminated either horizontally or vertically, and in some cases it may only take a few inches of pipe directly out the back of a direct vent appliance to the outside of your home. Be sure to follow your manufacturer's guidelines for maximum horizontal run, maximum vertical rise, etc. when designing your direct vent chimney system. The specifications for venting for each appliance will be spelled out in your owner's manual. 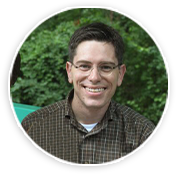 Direct vent units may be referred to as "top vent," "rear vent," or "slant-back." These titles refer to the position of the flue collar on the appliance. "Top vent" and "rear vent" are self-explanatory, and "slant-back" refers to an appliance with a flue collar coming out of the unit at a 45-degree angle, with easy adaptability for vertical or horizontal venting with the use of a 45 degree elbow. Many direct vent appliance manufacturers will offer specific horizontal or vertical venting kits for particular units. When looking into purchasing these kits, be sure to find out how much pipe you would be getting and if that would be enough to complete your system. Stove pipe, also called chimney connector, is not the same as class A chimney pipe, though the two are often confused with each other. Stove pipe is used for venting wood-burning stoves and is only for use inside the home, or, more specifically, inside the room where the stove is installed. Once the venting reaches the wall or ceiling, it must be converted to class A chimney pipe. Depending on which kind of stove pipe you use--single-wall or double-wall--you must also account for proper clearances from combustibles. For example, single-wall stove pipe requires 18 inches of clearance from ceilings or walls. Double-wall stove pipe, on the other hand, requires only 8 inches of clearance from a ceiling and 6 inches from a wall. Once these clearances are met, you must convert your stove pipe to class A chimney pipe for proper venting of your stove. Many stove owners from years past may be surprised to know that stove pipe is never permitted to go through a ceiling or a wall, no matter how much clearance you can create. Therefore, it is never safe to use only stove pipe for venting. This is simply a matter of the way these pipes are engineered. If used outside, stove pipe will be unable to maintain high flue temperatures, causing potential creosote buildup and increased risk of chimney fire. Class A chimney pipe requires only 2 inches of clearance to combustibles because it is made to handle the highest temperatures for exhaust. This is why you must convert from stove pipe to class A chimney pipe when venting your wood-burning stove. 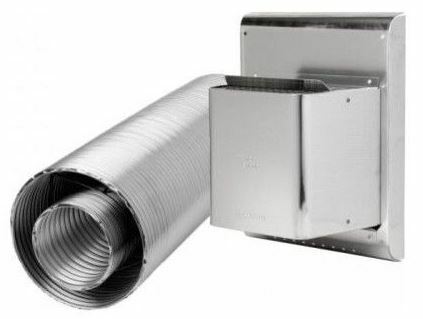 Through-the-ceiling: For venting systems that run vertically through a ceiling, you must have a ceiling support box or round ceiling support piece that will be your transition point from stove pipe to class A chimney pipe. The stove pipe will connect to the bottom and class A chimney pipe will attach to the other side, either running through the ceiling support box itself or an attic insulation shield (in the case of a round ceiling support). Through-the-wall: For venting systems that run horizontally through a wall, you must have a thimble. A thimble is designed to allow Class A chimney pipe to pass through the wall to run into room where your appliance is installed, and then connect to the stove pipe. Depending on what kind of stove pipe you use, the class A chimney pipe must come into the room 6 inches (for connecting to double-wall stove pipe) or 18 inches (for connecting to single-wall stove pipe). Most wood-burning stoves are top-vent models, meaning the flue collar will be on top of the unit. For any horizontal, through-the-wall venting system, you must have at least 12 inches of vertical rise from the top of the stove (not including the flue collar itself or any elbows) before connecting a 90-degree elbow piece to turn toward the wall. Some older wood-burning stoves are rear vent models. These models require the use of a tee for cleanout purposes at the flue collar. Like top-vent models, they require a minimum of 12 inches of vertical rise before directing the vent pipe horizontally. Please see your owner's manual for more details. This is one main difference between wood-burning and direct-vent stoves. Some direct-vent stoves are rear-vent models and are able to vent horizontally from the flue collar to the wall. Some other direct-vent stoves are "slant-back" models, meaning the flue collar is positioned at a 45-degree angle on the unit, allowing some versatility for vertical or horizontal venting without having to use a 90-degree elbow. For more information on venting direct-vent stoves, please see our section on direct-vent pipe. Type B gas pipe, also called "B-Vent" or "Natural Vent," is factory-built, double-wall metal pipe for venting appliances with draft hoods and other appliances listed for use with Type B gas vent. Whereas Type B pipe is becoming less and less prevalent in hearth product venting, many furnaces and water heaters use B-Vent piping for venting. The biggest reason for the declining use of Type B hearth products is their lack of efficiency, especially compared to direct vent and vent-free units. However, there is still a market for B-Vent piping for fireplaces because of its economic viability, which makes it particularly appealing for contractors and builders. Another advantage of Type B is that it is not typically susceptible to excessive draft problems, due in part to the draft hood that draws in excess air to moderate strong draft. Most B-Vent pipe has a one-inch clearance to combustibles. Type B pipe is never suitable to be used with wood-burning or coal-burning appliances. It should also never be used as free-standing exhaust pipe for high-temperature venting. Pellet vent pipe is used to vent pellet-burning or corn-burning stoves. These pipes are smaller in diameter than any other kind of pipe, usually with a diameter of 3 or 4 inches. Double-wall pellet pipe, like the Simpson DuraVent PelletVent Pro brand, requires only 1 inch of clearance to combustibles. Unlike stove pipe, you are not required to convert to class A chimney pipe when passing through a wall or a ceiling. Pellet pipe is used all the way from the pellet-burning or corn-burning appliance to the termination point. * Similar to direct-vent systems, pellet venting can be terminated either vertically or horizontally. If terminating horizontally, the cap must be at least 6 inches from the outer wall of your home. If terminating vertically, the cap must be at least 12 inches above the roof. If you are venting for a pellet-burning insert, however, your appliance will require a flex pipe to bypass the smoke shelf. At this point you would be able to convert to rigid chimney or pellet vent pipe with an adaptor. Please note that this code must be met with the 10-foot radius clear of any obstruction at the top of your pipe before your cap is installed. This rule is in place to ensure proper draft for your unit. If you have any questions about whether your system meets code with regard to this requirement, feel free to call us or email us and we will be happy to help. Vertical - A vertical termination cap is for use, obviously, when terminating vertically through a roof. Depending on which manufacturer of pipe you use, there may be some specialization options like a high-wind cap (to protect against wind), a low-profile cap (to protect against rain), or an extended vertical cap (to protect against extremely cold climates). 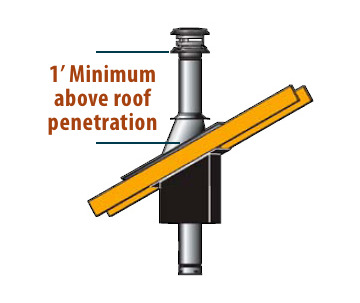 Depending on your roof's pitch, you may need anywhere from 1 to 5 feet of pipe extending past your roof line. (See Direct Vent Vertical Termination Chart). As always, check your manufacturer's guidelines for proper venting and termination of your unit. Some direct-vent caps are made of aluminum while others are made of stainless steel, which is preferable for longevity and reliability. Horizontal - One distinct difference in with direct-vent systems is the option to terminate horizontally on an outside wall. As with the vertical caps, there may be a few specialized options, including round or square caps. Be sure to check your manufacturer's guidelines for proper clearances for horizontal termination of your unit. These will include the appropriate distance from your wall, but also your windows, doors and other parts of the home. Also, some appliances may call for a minimum amount of rise before horizontal termination is permitted. Snorkel - Patented by Simpson Dura-Vent, this component is for horizontal through-the-wall terminations when a vertical rise is required to meet minimum height requirements. The most common use of this termination would be installations in basements and situations where your appliance is installed below grade. Type B systems can involve a multitude of distinct piping components, and the termination point is no different. B-Vent systems can only be terminated vertically, with several different kinds of caps available depending on your manufacturer's guidelines and requirements. See the chart to the right for help with measurements. Anchor Pate/Flue Adaptor - The vast majority of fireplaces, stoves and inserts need an anchor plate (usually for zero clearance and masonry fireplaces) or a flue adaptor (usually for stoves and direct vent fireplaces) in order to use a particular kind of chimney system. For example, if you purchase a zero clearance wood-burning fireplace with an 8" flue, and you want to use Simpson DuraVent DuraTech chimney pipe, you would need to use the DuraTech All-Fuel Chimney Pipe Masonry and Zero-Clearance Fireplace Anchor Plate (Item Number CPF-70877). 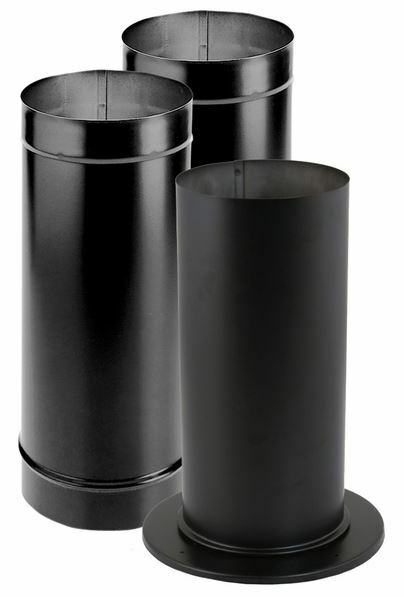 If you purchase a wood-burning stove with a 6" flue, and you want to use Simpson DuraVent DVL double-wall stove pipe, you would need the Dura-Vent DVL 6-Inch Double-Wall Stovepipe to Stove Flue Adaptor (Item Number CPF-69125). 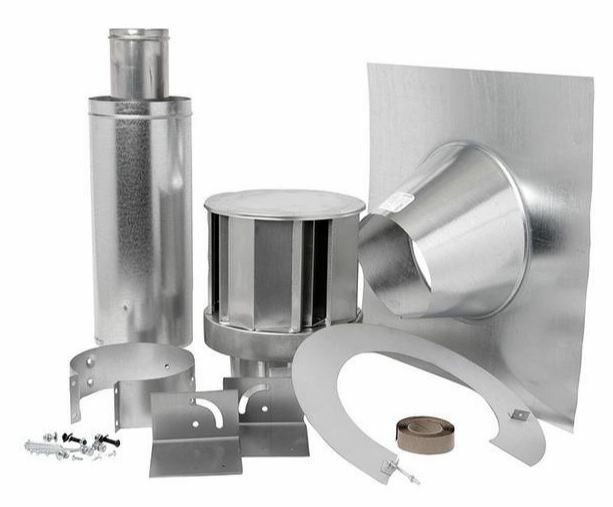 Elbow/Elbow Kit - Elbows are often needed in chimney systems for a variety of reasons, and unless you are able to vent straight up vertically or straight out horizontally, you are going to need an elbow of some kind. Each hearth appliance will have its offset guidelines clearly stated in its owner's manual, so please consult your appliance's manual for specific information regarding your unit. While many stove pipe and direct-vent pipe systems use 90-degree and 45-degree elbows, class A chimney pipe systems do not allow for more than a 30-degree elbow with a limited amount of offset (usually no more than just over 3 feet, and in many cases less)* permitted before you must connect another 30-degree elbow to end the offset. This is to protect your chimney's performance and protect against draft and flow problems. For this reason, most class A chimney manufacturers only sell elbows in kits that have two elbows and an elbow strap for support. When dealing with offsets with stove pipe and direct vent pipe, you can offset to go around an obstruction for up to nearly 60 inches for stove pipe and nearly 40 inches for direct vent pipe. Pellet Vent pipe, however, can be offset for almost 80 inches. *These are approximations. Please consult your appliance's section on offsets in its owner's manual, as well as the pipe manufacturer's guidelines for offset with each type of pipe. Elbow Strap/Wall Strap - Elbow straps are provided for many kinds of pipe to provide support for systems with offsets. Wall straps are needed when class A chimney or direct vent chimney runs vertically inside a chase or alongside a wall, with one needed usually every 4-5 feet of rise. Ceiling Support Box/Thimble - These components are necessary for use when the pipe is exposed and exiting the room where the appliance is. If you are venting vertically through the ceiling/roof, you will need a ceiling support box or a round ceiling support. If you are venting horizontally through the wall, you will need a thimble. In stove pipe systems, these components will serve not only as support pieces, but also as the transition point from stove pipe to class A chimney. In direct vent systems, these will be used only for support, as there is no transition to another kind of pipe. Firestop/Attic Insulation Shield - When passing through a ceiling, floor or attic, you will need to use one of these components. If a ceiling support is not used, the firestop is required for passing through ceilings in multi-story homes, while the attic insulation shield is required when passing through an attic. Both of these pieces ensure your pipe maintains proper clearances as it passes through combustible ceilings and floors. Chimney Tee/Tee Support - When your chimney system passes through the wall, you will need a tee and tee support to serve as a 90-degree bend to turn your chimney up toward your roof. Tees are most commonly used in stove pipe-to-class A pipe systems, as the pipe that exits the home needs to be turned 90-degrees to run vertically up to the roof for termination. All class A chimney tees will require the use of a tee support to be the base support point for the vertical pipe. Roof Support - Placed underneath the flashing on the roof, the roof support is designed to support pipe both above and below the roof. There is a limited amount of pipe it will support, particularly below the roof, but this component is ideal if you do not have a ceiling support box as part of your system. Flashing/Storm Collar - A flashing and storm collar go hand-in-hand; they are designed to protect your chimney system from weather damage. The flashing is the piece that covers the hole in your roof where the pipe penetrates. The storm collar fits around your pipe just above the flashing to prevent rain or snow from getting into the miniscule crevice between your flashing and pipe. You need to select a flashing appropriate for your roof pitch. 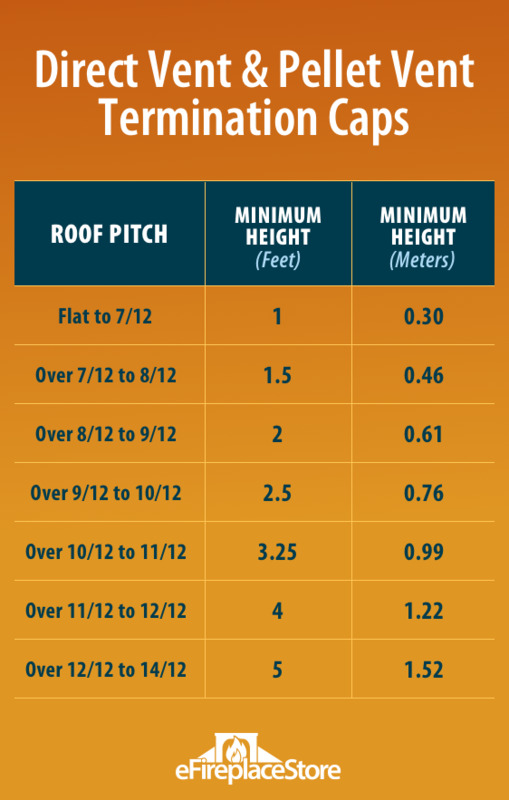 A roof pitch is a measurement of vertical rise over a horizontal distance of 12 inches. For example, if your roof has a vertical rise of 3 inches over a 12-inch horizontal distance, your pitch is 3/12. Extended Roof Bracket - When your chimney extends more than 5 feet above your roof, you need an extended roof bracket to provide stabilization for your pipe against the wind. We hope this has been helpful and informative. Remember, it cannot be stressed enough to consult your owner's manual above all else when considering how to vent your hearth appliance. In fact, some local codes require you to use only the kind of pipe listed in your owner's manual for your unit. 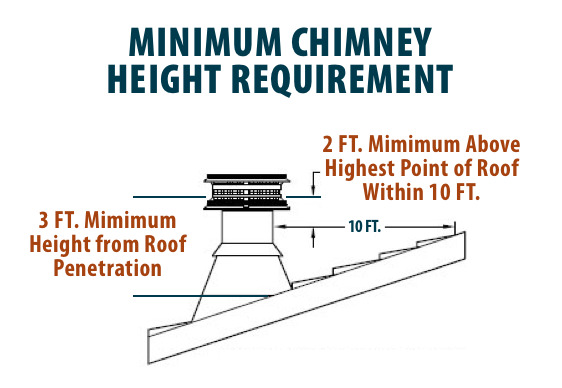 Always check with your local building code officials when designing a chimney system to ensure proper installation. If you have lost your owner's manual, please call us or email us and we will be happy to see if we can locate one for your fireplace, stove or insert.